Then ask yourself: Where do you even begin reading for intelligent insight into what's going on with crude? I had a similar feeling last night when I turned on CNBC and listened to hosts and guests (none of them energy experts… or PhDs, like Kent) attempt to quantify subtle oil price fluctuations in just the past two days. The political enigma that is Vladimir Putin. I'll stop at seven, but you get the point. And every hasty reaction was just repetition of someone else's statements, whether they were correct or not. There's a frantic game of telephone going on in the newsrooms over oil prices, and no one told the writers to rely less on gut instincts and more on proven fundamentals. Of course, that's the nature of the business media. It's not in their interest to repeat what you and I already know. When we look beyond their headlines, we see that energy has been the best place to invest over the last decade, and that the sector is already offering the greatest investment opportunities we'll ever get a chance to participate in. Today brings unprecedented opportunity to make money in the energy markets. From domestic production steadily booming in the United States to global demand reaching historic levels, there will be incredible prospects to profit based on both the long-term trends of the marketplace, and the short-term mistakes made by unprepared and unknowledgeable investors. The last 10 years were just the first glimpse of what stands on the horizon. And that decade was nothing to sneeze at. Because, over the last decade, we also saw historic growth in our preferred sector. Just look at the chart below to understand where we've been, before we revisit where it is we are going. 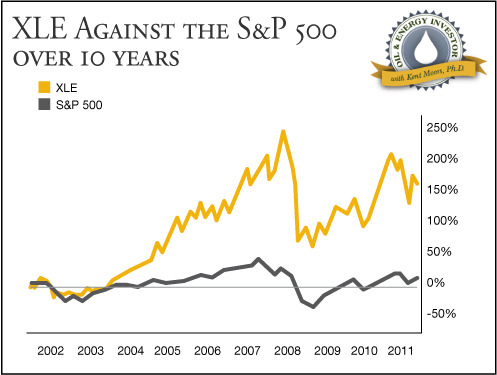 This chart represents the growth of the Energy Select Sector SPDR Fund (NYSE: XLE) over the past decade against the performance of the S&P 500. This index tracks results corresponding to the price and yield performance of the Energy Select Sector of the S&P 500 Index itself. Specifically, these are companies developing and producing crude oil and natural gas, and providing drilling and other energy-related services. Leaders in the group include ExxonMobil (NYSE: XOM), Chevron (NYSE: CVX), and ConocoPhillips (NYSE: COP). Since 2002, S&P 500 Index returns were modest, up 8.5% overall, and never increased above 50% over the period. Meanwhile, XLE is up more than 150%. What this proves is the power and performance of energy investing. See, even after all the flashy headlines and wild predictions, we're seeing an S&P that's barely moved over the long term. Meanwhile, the compulsion over the day-to-day price fluctuations misses the big picture in the energy sector. It doesn't matter what's happening one, two, or three weeks at a time. Not when you see the big picture and identify ways to play off the long-term fundamentals and short-term deviations. And that means big things for the future. How? Because it's the energy sector that drives growth in economies and affects the performance of every other sector. This is such a simple fact that I sometimes struggle to find the words to explain just how important it is. Look at it this way: Our entire standard of living is tied to this sector. The cost of energy is priced in everything we consume. Our supply chains, which traffic our foods, medicines, and other consumer basics, operate on fuels impacted by growing demand and fewer accessible supplies. Consumers feel the impact of the day-to-day shifts at the pump. Economies feel it over a much broader timeframe. And it is the growth and financial success of energy investors that remain the bedrock of economic expansion. When you invest in the energy markets, you are getting in on the ground floor of human progress. And that is both exciting and rewarding. All progress centers on our ability to continually power the technologies, human capital, supply chains, and growing economies that make growth possible. We have to place the energy sector on the same mantle as the overall economy. Energy stories should be the headline every day, not because of daily calamity in geopolitics, but because our biggest challenges and economic opportunities are aligned with this sector. Daily news stories will come and go. Some are relevant; many are not. When a potential pipeline divides the nation between corporate and environmental interests, the headlines focus on the debate of Washington celebrities. But they never tell the story about the booming midstream companies that are building pipelines and transporting fuels from upstream energy producers to downstream refiners and retailers, or the investing story. And when a rig sinks off the coast of Russia, the media latches onto the stories of the survivors. But they fail to tell us that, in the future, more rigs of this kind will be necessary in order to access unconventional sources of crude. Or what that means for upstream producers and service companies. And when it's announced that gasoline exports have reached record levels in the United States, a political squabble about corporate responsibility ensues. But no one focuses on the fact that the United States has a profound strength in refining and that many companies stand to profit from the global shipments of and demand for transportation fuels. Because you're seeking answers to the right questions, and because you understand the big picture, you'll have an incredible advantage moving forward. Speculation and headlines may dominate the short-term, but long-term fundamentals and the stories behind the headlines present the real opportunities. We're focused on growth in emerging markets, the decline of conventional supplies, increased speculation on paper barrels. Increased demand for a supply that has rising costs to produce. These fundamentals will always triumph when dealing with a global commodity of such vital importance. There are remarkable stories on the horizon, each part of a greater opportunity that Kent and I continue to look forward to exploring with you each week. For now, consider shares of the XLE. You've seen how it can perform over time. And that's not going to change in this sector. And, of course, if you want to get more bang for your buck, invest in Kent's favorite energy plays. And, as the new year approaches, take comfort in knowing that we not only have a chance to be living witnesses to history… but that we also have the power to be its most successful investors. We definitely need to know the market trends – and none is more important than that of energy – and global is not a too big word to use here,thank you! Can’t help but think that the newly producing oil shale in the US and Canada will make Iran’s oil less valuable as it’s shipped world-wide. Could this be the reason that the Keystone Pipeline is suddenly a problem for the State Department? Please don’t put on presentations that don’t tell me how long they go on! I will not watch!